Why do you want to Repeal Richard Neal? Over entire campaign, I have stated time and time again some of the reason why Richard Neal does not deserve another term in Congress. I have also shared with you my vision for bringing new ideas to Washington. Now, I want you to let me know why you think Richard Neal should be sent packing back to the Second District. 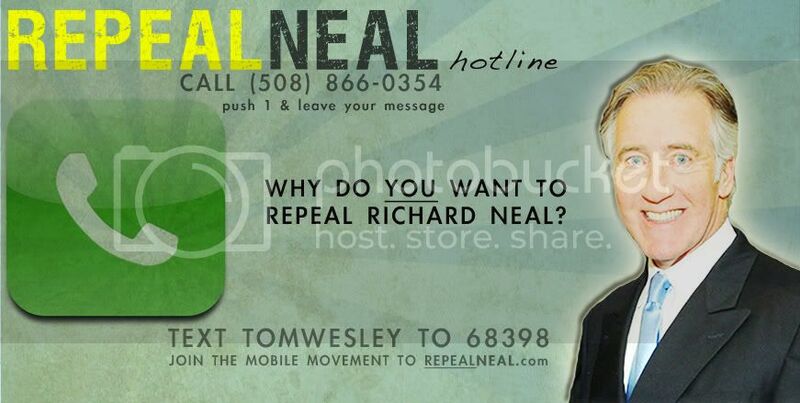 I invite you to call the REPEAL NEAL HOTLINE at (508) 866-0354, press 1 and leave your message on why you want to Repeal Richard Neal. 1) Richard Neal has voted with Nancy Pelosi 98% of the time. 2) Richard Neal Has been in Washington for 22 years. 3) Richard Neal failed to respond to my letter, email or phone call. 4) Richard Neal voted for the government takeover of healthcare, better known as ObamaCare, that hurts businesses and drastically expands government. 6) Richard Neal voted for the failed stimulus package that increased our debt and failed to stimulate the economy or get people back to work. 7) Richard Neal Voted to increase the national debt limit by $1.9 trillion to a total of $14.29 trillion, and continue the criminal burdening of our children and grandchildren with more and more debt. 10) Voted against banning all federal funding for the scandal-plagued advocacy group ACORN.